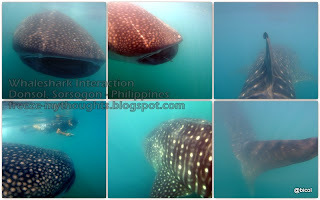 More about Whaleshark Interaction, see my Donsol Travel Guide here. I've looked forward to summer like never before. With back to back trips from Donsol, Sorsogon, CamSur Wakeboarding Complex and Batanes, I am overwhelmed and fascinated. With tan lines all over, add all the superlatives, now my thoughts are garbled! I can't seem to make a decent post. While on the plane, our flight was announced delayed for reason that documents have yet to be completed and Legaspi airport is closed and learned that our companions' flight out of Manila was likewise delayed for an hour. What the #@?!! I was anxious, this can't be... nothing should go wrong. It was hell of a pressure to set foot in Donsol and see the whalesharks. I knew I can't go back home not seeing one otherwise I'll be at the receiving end of all possible mockery. For those who knows my tale, the long wait was worth it. If it rains it pours, this time it poured with so much luck! We were met at the airport by a van driver arranged by the resort. 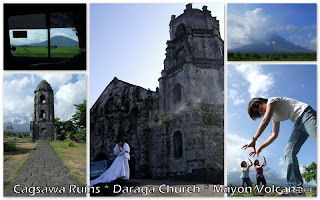 Before heading to Donsol, we dropped by Cagsawa Ruins and Daraga Church. The Mayon Volcano was standing high and mighty across Legaspi City. The Mayon Volcano is best viewed from a distance between 6 to 8 in the morning when skies are clear. With P10 entrance fee, we entered Cagsawa Ruins with the Mayon Volcano on the background. Once in Cagsawa Ruins, you'll be met by local kids, age 10 to 16, they will start by narrating the history of Cagsawa Ruins with visual presentation, then later offers to take your pictures with camera tricks. Good thing I've read an article about it, otherwise I would have shooed them away. I tell you, they are very creative. They even knew how to use my digital camera more than I do. In the end, you won't hesitate to give them a tip. Afterwhich, we proceeded to an hour land trip to Vitton Resort in Dancalan Beach Resort, registered at the Donsol Tourist Center next door and met by a lovely sunset. Next day was judgement day, I booked the best Butanding Interaction Officer, Omar. He was the videographer of Donsol (the movie) and guide to celebrities like Korina Sanchez of Balitang K and Dianne Castillejo of Sports Unlimited. He took care of the booking of the boat, skipper, spotter, gear and everything else. It was non-stop sightings between 730 to 11am, we barely had time in between to reapply sunblock or to grab a sandwich. Just in time we get settled on the boat, the guide shouts "ready!". Who am I to complain? I rushed to put on my fins over and over again, be the first to sit on the edge of the boat and lucky to be dragged by the guide through and through. Twas an amazing encounter with the gentle giants. I've lost count, but I can safely say we swam with 5 different whalesharks in more than 8 occasions. But it's not in the numbers. The first one was the biggest and the friendliest. It didn't mind our presence, interaction lasted a good 30 minutes... it could have been longer but we could not keep up, after having our portraits alongside it (so I have proof to brag). I was literally panting the first time when fear sinks in, then excitement sets in and eventually breath rans out. I probably gulped a liter of water with planktons (eew!) and heard someone screamed underwater. With that first encounter, we were already very much content but they just kept coming and coming, even on our way back to shore. 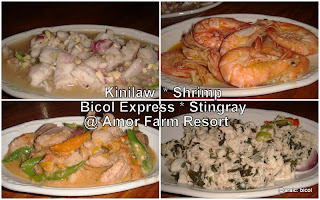 The rest of the day was a lazy afternoon, spent an hour of thanksgiving mass in Donsol, Church in their native dialect and nourished our hungry pangs at Amor Farm Resort. It was a totally awesome experience, I don't mind going back someday. MISSION ACCOMPLISHED! off we went to Camsur Watersports Complex.